A blog celebrating books and the wonderful authors who create them. Here it is - Closer. You wouldn’t mess with Mel. She doesn't care about much, but when things go wrong at home, she cares. She has to find out what’s going on. It’s not a choice. And when she does, everything in her life falls apart. And everything has to change. 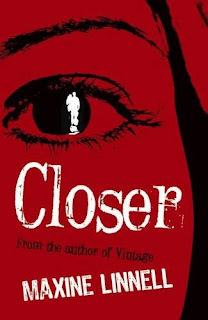 Closer is a difficult story that needs to be told, and heard, a story about what happens when a dad gets too close. But most of all, it’s a story about Mel – funny, outrageous, emotional, brave. You won’t forget her. Mel's parents have been fighting lately, mostly about jobs, but their fights continually expand to include other topics including Mel's sister's leaving. Mel goes about her normal routine for the most part, trying to impress a boy named Raj. Her whole world revolves around avoiding her family's fights, school, and boy trouble while her sister, Hannah, fades into the background. Mel stays home from school one day under the guise of feeling sick/sad about her grandmother's recent death and snoops in Hannah's diary. It is within the diary that she begins to understand her family's dynamics and why Hannah is so unhappy. Mel's character is easy to relate to. She acts like a normal teenager, sometimes whiny and sometimes angry. Her sister, Hannah, and her fight regularly. Hannah always seems sad and perhaps depressed. Mel's father is portrayed as being young and somewhat depressed over his job troubles. The reader will be interested to discover who is the true antagonist in this book. The other characters are not as focused upon. Chloe is a good friend to Mel and helps her out when she needs it. Mel's mother is very argumentative due to stress and misses a few problems within her family that desperately need her attention. Overall, this book is a quick read and hard to put down. The author writes from the standpoint of a teenager and actually pulls it off-the reader can completely believe the Mel is the one narrating the story. The book does touch on difficult subjects and is better suited to young adult/adult readers. This product or book may have been distributed for review, this in no way affects my opinions or reviews. Interview with Author Elise Stephens! The Public Defender by M. D. Cliatt GIVEAWAY! Scorpio Rising by Monique Domovitch Excerpt! Welcome to the 12 Pearls of Christmas! Join Bloggers in the Paypal Cash giveaway! Book Lover's Holiday Giveaway Hop! COPYRIGHT © 2014 LIVE TO READ Copyright Live To Read 2014. Please do not take any content of any sort from the blog without permission.